Traditionally, Singapore has been a bogey circuit for Mercedes, and heading there this weekend the German feared the worst. However, despite Ferrari‘s pace in FP2 and FP3, Lewis Hamilton produced one of the finest qualifying laps ever, to take a shock pole. While taking nothing away from the Briton’s lap, which left his Mercedes teammate, Valtteri Bottas, 0.687s in his wake, Toto Wolff admits that credit must also be given to the team in its reaction to the disappointment of Spa. “I must really, really take my hat off to the work that was done in Brackley and in Brixworth to prepare the car and the engine for this race,” said the Austrian. “It was our weakest race track together with Monaco, we were really not competitive in the past. “We found the right clues,” he continued. “The difficult days in Spa have given us direction and at least for a qualifying lap this team has made a major step forward today, over this weekend generally. Again it was the tough experiences from the past that showed us the way. “In F1 man doesn’t work without machine and machine doesn’t work without man,” he added. “It was teamwork. I think from Lewis’s side, it was stardust. The most epic lap I’ve ever seen from him. I never go on the radio, it was the first time I went on the radio today because I didn’t see anything like this before. However, it wasn’t entirely plain-sailing, Hamilton venting his obvious frustration when also missing the cut in Q1 when the team sent him out twice on ultrasofts in a bid to save its hypersofts for the race. “We were all quite stressed out,” Wolff admits. “We couldn’t find enough pace between the ultra and others running on hyper. Nobody else was running on hyper so that surprised us too. But the other strategy would have been to run the hyper in Q1 and compromise your Q2 running. In hindsight it was the best possible outcome, because we were the only team running four hypers. So maybe that made a difference also. 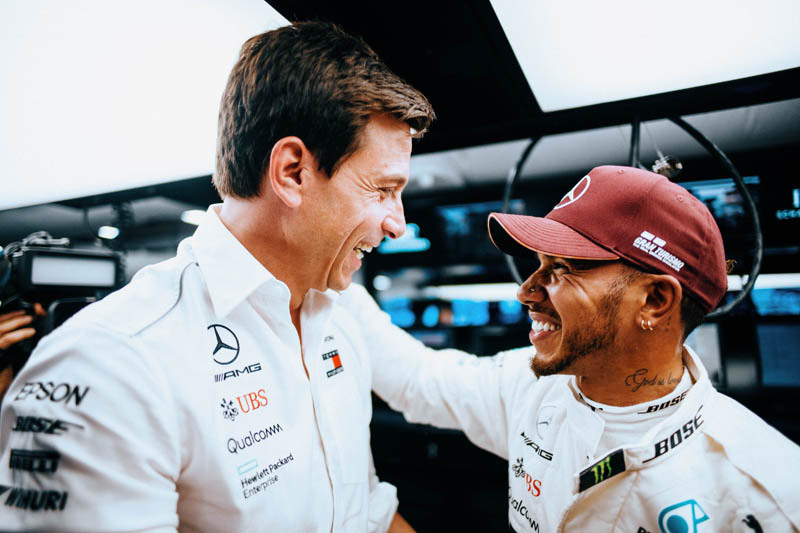 Admitting that the team had pondered attempting to use ultras in Q2 also – a move that nobody else opted for – the Austrian said: “We were thinking of splitting the strategy between the two cars and running one on ultras and the other one on hypers. But it was immediately clear that none of the front-running teams had the pace to go through.